Entering camp, the expectation was that Carlos Martinez would regain his standing as a member of the Cardinals’ starting five. That may ultimately come to pass, though he’ll first need to work back to full strength. In Martinez’s absence, Mark Saxon of The Athletic tweets, the Cards will utilize either John Gant or Dakota Hudson to round out the rotation. Gant, 26, is one of several out-of-options Cardinals hurlers. He pitched to a 3.47 ERA last year in 114 frames over 19 starts and seven relief appearances. The results came in spite of a marginal combination of 7.5 K/9 and 4.5 BB/9 with a 45.1% groundball rate. Gant’s success was driven largely by suppression of home runs (0.71 per nine) and batting average on balls in play (.253), the sustainability of which is questionable. If he’s not in the rotation, Gant will either need to find a landing spot in the bullpen or be exposed to waivers. Options abound for Hudson, a 24-year-old former first-round pick. He could begin the season as the fifth big-league starter, take a job in the MLB pen, or stay stretched out in the Triple-A rotation. In 19 starts last year at the highest level of the minors, Hudson worked to a 2.50 ERA over 111 2/3 innings with 7.0 K/9 and 3.1 BB/9 to go with a hefty 57.5% groundball rate. 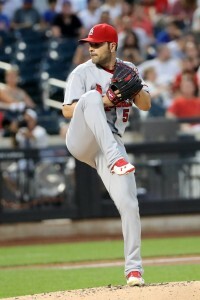 The worm-burners kept coming during his 26-appearance foray into the Cards pen. Though he managed only 19 strikeouts against 18 walks in his first 27 1/3 MLB frames, Hudson allowed nary a home run. That’s no fluke; Hudson has permitted only eight long balls in over three hundred professional innings pitched. Austin Gomber and Daniel Ponce de Leon are other 40-man members that might have been seen as possibilities. Each started MLB contests last year but has evidently already been ruled out of the Opening Day rotation race. As the news further suggests, hugely talented youngster Alex Reyes is also out of the mix to open the season as a starter. But that doesn’t mean he’ll necessarily be optioned at the end of camp. As Derrick Goold of the St. Louis Post-Dispatch tweets, manager Mike Shildt says that Reyes will be considered for a relief post. Reyes, 24, is working back from significant shoulder and elbow surgeries and will surely face innings limitations. JUNE 25: The expectation is that Wacha will be out until after the All-Star break, Cards GM Mike Girsch tells reporters including MLB.com’s Jenifer Langosch (via Twitter). Given the nature of the injury, it’s no surprise to hear that he has already more or less been ruled out for that duration. What’s interesting about the timing is that the Cardinals may or may not have a clear picture of Wacha’s outlook when the trade deadline hits. If he’s close to full strength or back in the majors, perhaps rotation depth won’t be as much of a need. Any significant uncertainty surrounding Wacha would boost the likelihood of a move to add a starter, though it’s also possible the St. Louis organization will focus on other, more pressing roster needs regardless. JUNE 21, 10:50pm: The Cardinals have termed the oblique strain to be “moderate,” per MLB.com’s Joe Trezza (Twitter link). While it’s obviously good news for the team that Wacha isn’t looking at a severe strain that’ll keep him out for months, Trezza notes that the team still expects to be without Wacha for “at least” a couple of weeks. 2:26pm: The Cardinals announced that they have placed righty Michael Wacha on the 10-day DL, as had been expected. He’s dealing with a left oblique strain. Fellow righty John Gant will come up to take his place on the active roster. For the time being, Gant may move into the pen, though the Cards will ultimately have to fill in a rotation opening. At present, the team will rely on Carlos Martinez, Miles Mikolas, Luke Weaver and Jack Flaherty in the starting five. Gant could step into that role, though the team also has rotation options in the form of Austin Gomber and Daniel Poncedeleon. The open question is just how long the St. Louis organization will go without Wacha. He has had a strong campaign to date, working to a 3.20 earned run average with 7.6 K/9 against 3.8 BB/9 through 84 1/3 innings. The Cardinals didn’t provide an immediate timeline, though even Grade 1 oblique strains have been known to keep players on the disabled list for upwards of a month. With Alex Reyes already out for the season and Adam Wainwright’s status still uncertain, the pressures on the rotation are mounting. 6:04pm: Both teams have announced the trade via press release. 5:20pm: The Braves have been one of the most active teams of the offseason thus far, and that continued on Thursday as the team reportedly struck a deal to acquire veteran lefty Jaime Garcia from the Cardinals in exchange for minor league infielder Luke Dykstra and young right-handers John Gant and Chris Ellis. Garcia, 30, has long been a steady member of the Cardinals’ rotation but struggled a bit in 2016, working to a career-worst 4.67 ERA with 7.9 K/9, 3.9 BB/9 and a very strong 56.7 percent ground-ball rate in 171 2/3 innings. He’s controllable only through the 2017 season, as the Cardinals exercised his $12MM option at season’s end. Despite the fact that St. Louis picked up that option, though, trading Garcia has long seemed like a highly plausible outcome. The Cards already have Carlos Martinez, Adam Wainwright, Mike Leake and Alex Reyes in the fold in addition to right-handers Michael Wacha and Lance Lynn returning from injuries. As for the Braves, Garcia will be the third veteran arm they’ve added to their rotation already this winter. He’ll join fellow newcomers Bartolo Colon and R.A. Dickey in the Braves’ rotation behind right-handers Julio Teheran and Mike Foltynewicz. Like Colon and Dickey, Garcia is a one-year commitment that can function as a reasonable stopgap to upper-level arms in the Braves system like Sean Newcomb while also give young righties Aaron Blair and Matt Wisler, who have struggled in the Majors, additional time to develop in Triple-A. Despite Garcia’s 2016 struggles, he’ll bring to the Braves a career 3.57 ERA with 7.3 K/9, 2.6 BB/9 and a 56.5 percent ground-ball rate in 896 innings as a Major Leaguer. Shoulder injuries have limited him throughout his career, and he missed time with a groin strain as well in 2016, but he’s averaged 151 innings in 2015-16 and made a total of 50 starts in that time. While the Braves have been connected to Chris Sale and other front-of-the-rotation names in trade chatter, the addition of Garcia lessens the chances of that hope becoming a reality for Atlanta fans, though it doesn’t eliminate the possibility. Both Mark Bowman of MLB.com and Ken Rosenthal of FOX Sports note (Twitter links) that the Braves still intend to pursue front-line starters. The rotation certainly looks full at the moment, but it’s possible that as a young right-hander with a fair bit of MLB experience under his belt, Foltynewicz himself could be added to a trade package to help bring in a significant upgrade (though that’s merely speculation). Each of Ellis (No. 17), Gant (No. 21) and Dykstra (No. 29) appeared on MLB.com’s midseason list of the Braves’ Top 30 prospects. Ellis, who turned 24 in September, was acquired with Newcomb in last year’s Andrelton Simmons trade. The former third-rounder posted a strong 2.75 ERA in 78 innings at the Double-A level this year, averaging 7.0 strikeouts against 4.0 walks per nine innings before moving up to the Triple-A level. He struggled in 67 2/3 innings with Triple-A Gwinnett, though, working to a 6.52 ERA. He did register an improved 8.6 K/9 mark, though he also averaged 6.9 walks per nine innings there as well. MLB.com’s report on Ellis notes that he has the size, strength and repertoire to become a No. 4 starter with three average to above-average offerings but slightly below-average command. Gant, also 24, was acquired from the Mets in the 2015 Kelly Johnson/Juan Uribe trade and made his MLB debut last year, totaling 50 innings with a 4.86 ERA. Gant logged 49 strikeouts against 21 walks with a 42.1 percent ground-ball rate. He also worked to a 4.18 ERA with better than a strikeout per inning in 56 Triple-A innings. Jonathan Mayo and Jim Callis of MLB.com call Gant’s fastball, changeup and curveball each an average offering but also note that he has a tremendous feel for pitching. Nonetheless, they peg his ceiling as a back-end starter, albeit one that could conceivably join the Cardinals’ staff immediately out of Spring Training if necessary. Dykstra, the son of former Mets/Phillies outfielder Lenny Dykstra, is a 21-year-old middle infielder that the Braves plucked with their seventh-round pick back in 2014. He went through his second stint in the Class-A South Atlantic League in 2016, hitting .304/.332/.363 with no homers and seven stolen bases in 81 games. Callis and Mayo call him a fringe defender with an average arm and note the he hasn’t shown any power to this point in his career, but his hit tool draws strong marks — and that skill is reflected in his career .300/.335/.385 batting line through parts of three minor league seasons. ESPN’s Mark Saxon first reported that Garcia had been traded to the Braves. FanRag’s Jon Heyman reported (on Twitter) that three prospects were going to St. Louis in exchange. Joel Sherman of the New York Post reported that Dykstra and Ellis were in the deal (Twitter link). SB Nation’s Chris Cotillo reported Gant was the third piece (Twitter link).